Weighing GA aircraft, helicopters, turboprops, corporate jets, UAV/UAS, or transport category airliners can be accomplished in two ways: top of jack load cells and platform scales. Equipment selection is dependent on the operator's needs and or equipment currently on hand, as well as the airframe manufacturer's recommendations. Top of jack load cells, as the name implies, can be used on top of the current wing jacks or can be used under axle for larger jets. 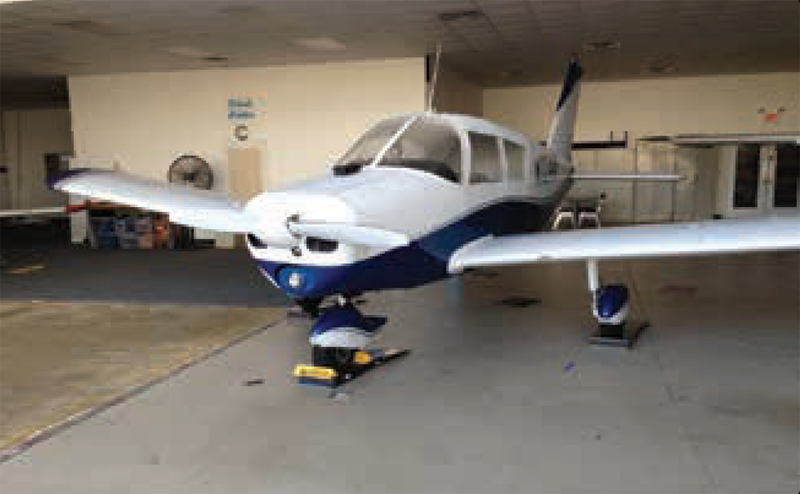 Platforms are very useful for small shops that do not have jacks for every type of aircraft. 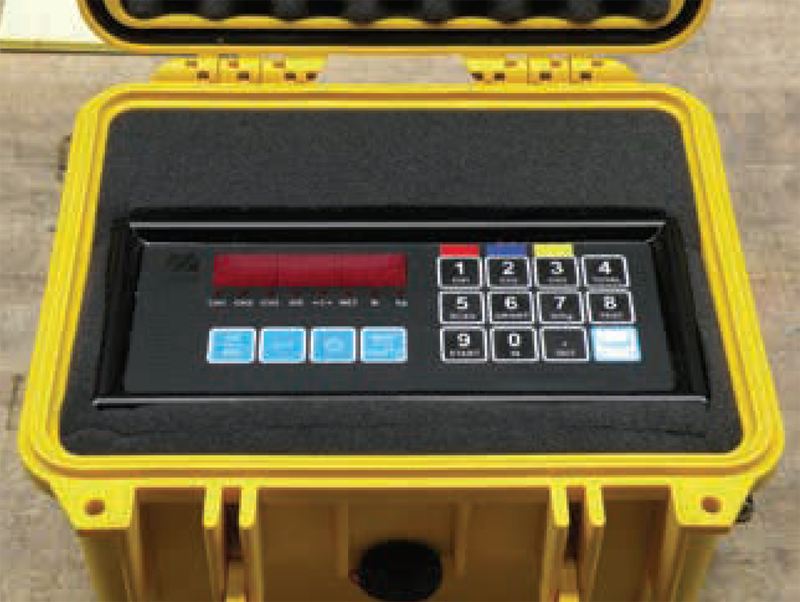 Both types of scales feature new technologies using wireless operations with computer-based indication and cable-based wired digital indication. Mechanical or analog meter scales have mostly been replaced with the new wireless systems and or digital indicators. These systems and indicators are very accurate and easy to use, making the weighing job faster to accomplish and providing higher quality in readings. Platforms are available in many weight ranges and sizes. These systems either use ramps or the aircraft can be jacked and lowered onto the platforms during regular maintenance. Platforms are easy to use and are a choice for many shops that do not have jacks for the many types of aircraft to be serviced. The limiting factors for platforms are the weight range and the tire size, some aircraft have large tires and the platform may be too small for the specific aircraft tire. It is important to always use the right size scale and platform for the aircraft type and weighing job required. The platform scale sits on the hangar floor in a level condition. Ramps and a tug are used to position the airplane tire on top of the platform and centered. Built into the platform is an electronic load cell(s) that sense the weight being applied to it, which generates a corresponding electrical signal. Inside the load cell is an electronic strain gauge that measures a proportional change in electrical resistance as the weight being applied to it increases. An electrical cable or wireless signal runs from the platform scale to a display unit, computer, or tablet, which interprets the resistance change of the load cell and equates it to a specific number of pounds. A digital readout on the display shows the weight. In Figure 1, a small Piper is being weighed using wireless platform scales that incorporate electronic load cells. In Figure 2, a Cessna 182 airplane is being weighed with portable electronic platform scales. If an aircraft is weighed on platform scales, the only way to level the aircraft is to deflate tires and landing gear struts accordingly. This type of scale is easy to transport and can be powered by household current or by a battery contained in the display unit. The display unit for the standard wired platform scales is very easy to use. [Figure 3] Turn on the power and the unit runs through the software and displays the scales in a total mode. Pressing on the ZERO KEY (blue key not the number key) will ZERO the channels. Once completed, the unit will read -0- and the scale is ready to use. Select the channels by number and pressing the PRINT/SELECT KEY. All channels can be returned to TOTAL MODE by entering the number 4 TOTAL followed by the PRINT/SELECT KEY. If all three scale switches are turned on at the same time, the total weight of the airplane is displayed. The second type of aircraft scale is a top of jack, cell-based scale, where each jack point receives a cell-based transducer on the top of the jack. It is very easy to use and level the aircraft during the weighing operation. The system is easy to transport, light weight, and simple to set up. 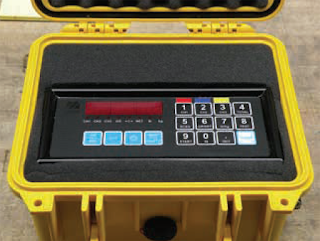 The operator must have a jack capable of receiving and mounting the cell. Cells come in many weight ranges and are dependent on the weight required per point to accomplish the weighing and receiving the actual jack point type. The top of the load cell has a concave shape that matches up with the jack pad on the aircraft, with the load cell absorbing all the weight of the aircraft at each jacking point. Each load cell either has an electrical cable attached to it or is wireless, which connects to the display unit or computer read out that shows the weight transmitted to each load cell. An important advantage of weighing an aircraft this way is that it allows the technician to level the aircraft easily. 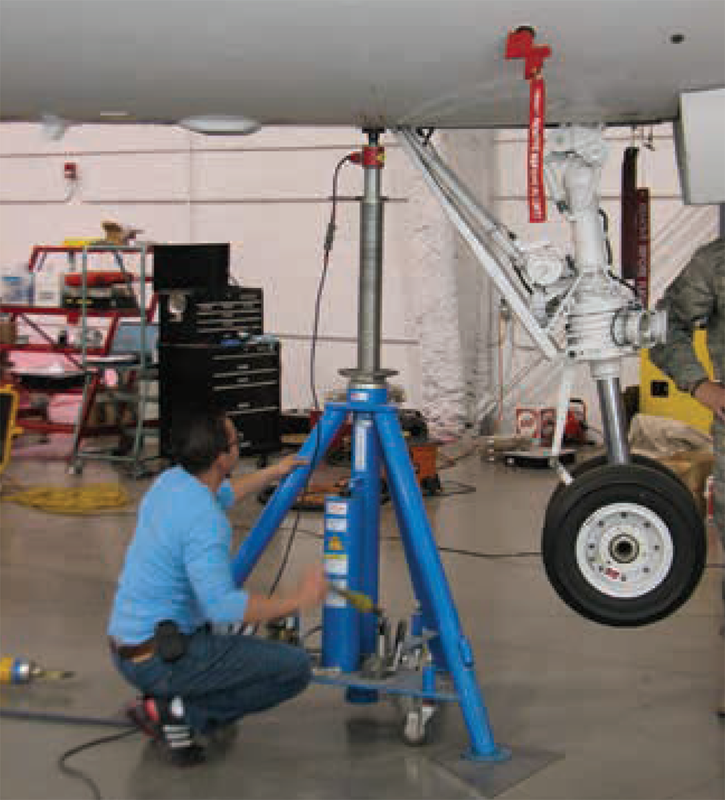 When an aircraft is weighed using load cells on jacks, leveling the aircraft is done by adjusting the height with the jacks and checking the level at the level point. Figure 4 shows a Gulfstream jet on jacks with the load cells in place. Always follow the aircraft manufacturer’s weighing and leveling procedures and processes. All aircraft need to be in a flight level attitude when they are weighed unless the manufacturer’s manual specifically allows it or has a formula in the manual to use accordingly. Before an aircraft can be weighed and reliable readings obtained, it must be in a level flight attitude. 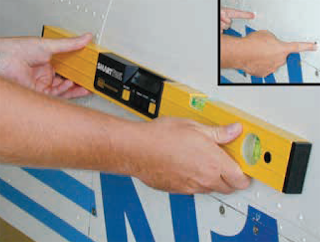 One method that can be used to check for a level condition is to use a spirit level, sometimes thought of as a carpenter’s level, by placing it on or against a specified place on the aircraft. Spirit levels consist of a vial full of liquid, except for a small air bubble. When the air bubble is centered between the two black lines, a level condition is indicated. 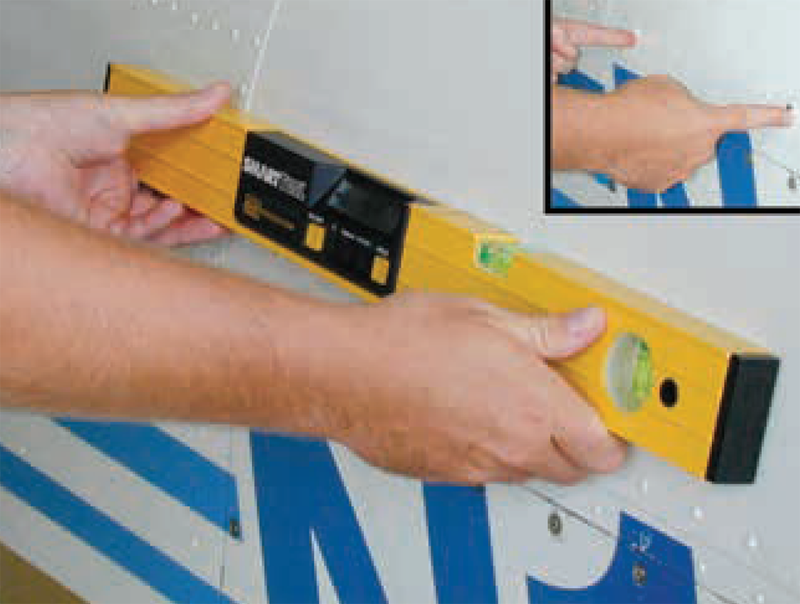 In Figure 5, a spirit level is being used on a Mooney M20 to check for a flight level attitude. By looking in the TCDS, it is determined that the leveling means is two screws on the left side of the airplane fuselage, in line with the trailing edge of the wing. A plumb bob is a heavy metal object, cylinder or cone shape, with a sharp point at one end and a string attached to the other end. If the string is attached to a given point on an aircraft, and the plumb bob can hang down so the tip just touches the ground, the point where the tip touches will be perpendicular to where the string is attached. An example of the use of a plumb bob would be measuring the distance from an aircraft’s datum to the center of the main landing gear axle. If the leading edge of the wing was the datum, a plumb bob could be dropped from the leading edge and a chalk mark made on the hangar floor. The plumb bob could also be dropped from the center of the axle on the main landing gear, and a chalk mark made on the floor. With a tape measure, the distance between the two chalk marks could be determined, and the arm for the main landing gear would be known. 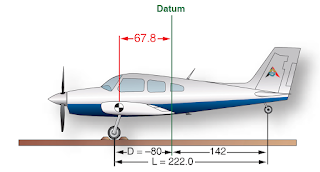 Plumb bobs can also be used to level an aircraft, as described in the Helicopter Weight and Balance section of this chapter. Figure 6 shows a plumb bob being dropped from the leading edge of an aircraft wing. When an aircraft is weighed with full fuel in the tanks, the weight of the fuel must be accounted for by mathematically subtracting it from the scale readings. To subtract it, its weight, arm, and moment must be known. Although the standard weight for aviation gasoline (Avgas) is 6.0 lb/gal and jet fuel is 6.7 lb/gal, these values are not exact for all conditions. On a hot day versus a cold day, these values can vary dramatically. 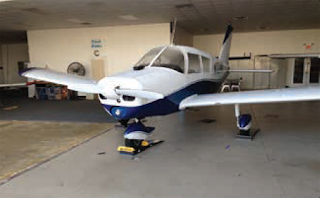 On a hot summer day in the state of Florida, Avgas checked with a hydrometer typically weighs between 5.85 and 5.9 lb/gal. 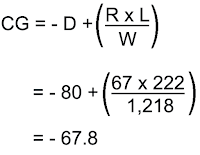 If 100 gallons of fuel were involved in a calculation, using the actual weight versus the standard weight would make a difference of 10 to 15 lb. When an aircraft is weighed with fuel in the tanks, the weight of fuel per gallon should be checked with a hydrometer. A hydrometer consists of a weighted glass tube that is sealed with a graduated set of markings on the side of the tube. The graduated markings and their corresponding number values represent units of pounds per gallon (lb/gal). When placed in a flask with fuel in it, the glass tube floats at a level dependent on the density of the fuel. Where the fuel intersects the markings on the side of the tube indicates the pounds per gallon. Weighing an aircraft is a very important and exacting phase of aircraft maintenance and must be carried out with accuracy and good workmanship. Thoughtful preparation saves time and prevents mistakes. The aircraft should be weighed inside a hangar where wind cannot blow over the surface and cause fluctuating or false scale readings. The aircraft should be clean inside and out, with special attention paid to the bilge area to be sure no water or debris is trapped. The outside of the aircraft should be as free as possible of all mud and dirt. Scales, hoisting equipment, jacks, and leveling equipment. Blocks, chocks, or sandbags for holding the airplane on the scales. Straightedge, spirit level, plumb bobs, chalk line, and a measuring tape. 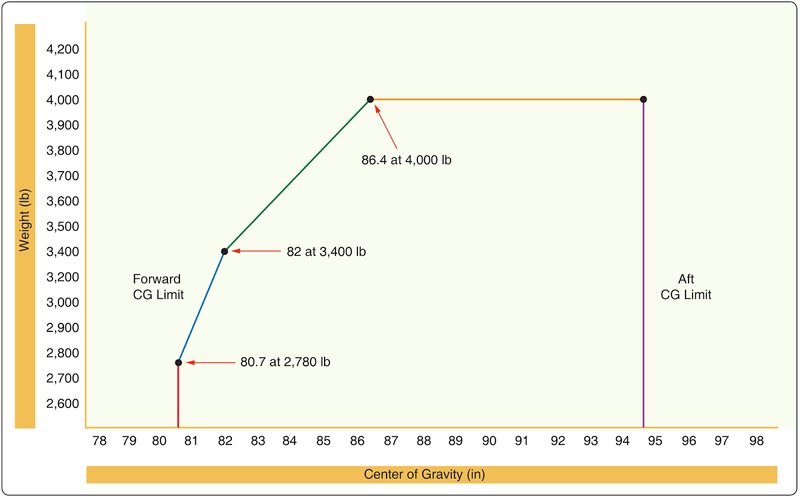 Applicable Aircraft Specifications and weight and balance computation forms. When weighing an aircraft to determine its empty weight, only the weight of residual (unusable) fuel should be included. To ensure that only residual fuel is accounted for, the aircraft should be weighed in one of the following three conditions. 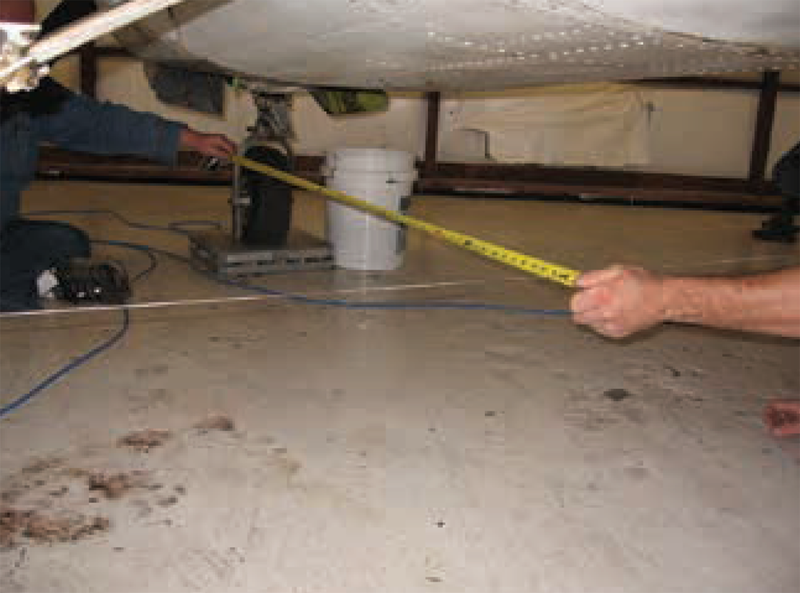 Weigh the aircraft with absolutely no fuel in the aircraft tanks or fuel lines. 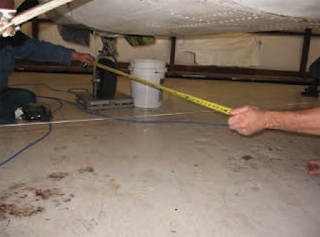 If an aircraft is weighed in this condition, the technician can mathematically add the proper amount of residual fuel to the aircraft and account for its arm and moment. The proper amount of fuel can be determined by looking in the aircraft’s TCDS. Drain fuel from the tanks in the manner specified by the aircraft manufacturer. If there are no specific instructions, drain the fuel until the fuel quantity gauges read empty and until fuel stops draining from the tanks. The aircraft attitude may be a consideration when draining the fuel tanks and the maintenance manual should be consulted. In this case, the unusable fuel will remain in the lines and system, and its weight and arm can be determined by reference to the aircraft’s TCDS. Weigh the aircraft with the fuel tanks completely full. 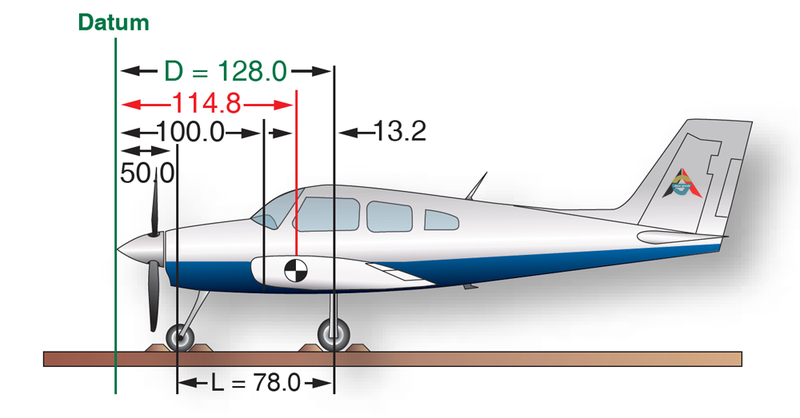 If an aircraft is weighed in this condition, the technician can mathematically subtract the weight of usable fuel and account for its arm and moment. If the weight of the fuel is in question, a hydrometer can also be used to determine the weight of each gallon of fuel, while the Aircraft Specifications or TCDS can be used to identify the fuel capacity of the aircraft. 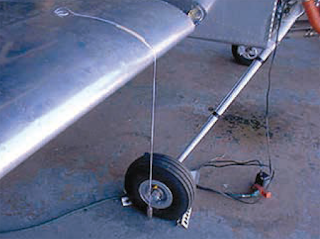 If an aircraft is to be weighed with load cells attached to jacks, the technician should check both the load cell instruction manual and aircraft maintenance manual to make sure it is permissible to jack the aircraft with the fuel tanks full as this may add additional stress to the aircraft structure. Never weigh an aircraft with fuel tanks partially full, because it will be impossible to determine exactly how much fuel to account for. The empty weight for older aircraft certificated under the Civil Air Regulations (CAR) part 3 does not include the engine lubricating oil. The oil must be drained before the aircraft is weighed, or its weight must be subtracted from the scale readings to determine the empty weight. To weigh an aircraft that does not include the engine lubricating oil as part of the empty weight, place it in level flight attitude, then open the drain valves and allow all the oil that is able, to drain out. Any remaining is undrainable oil and is part of the empty weight. 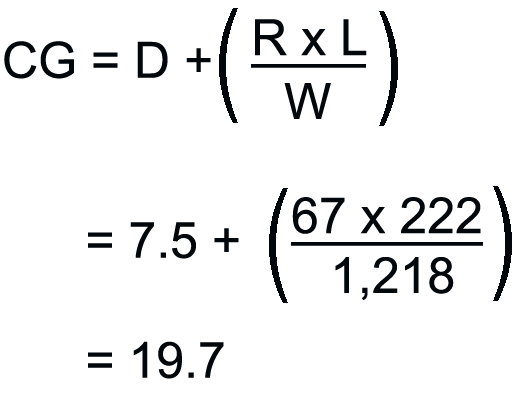 If it is impractical to drain the oil, the reservoir can be filled to the specified level and the weight of the oil computed at 7.5 lb/gal. Then its weight and moment are subtracted from the weight and moment of the aircraft as weighed. The amount and arm of the undrainable oil are found in NOTE 1 of the TCDS, and this must be added to the empty weight. For aircraft certificated since 1978 under 14 CFR parts 23 and 25, full engine oil is typically included in an aircraft’s empty weight. This can be confirmed by looking at the TCDS. If full oil is to be included, the oil level needs to be checked and the oil system serviced if it is less than full. The hydraulic fluid reservoir and all other reservoirs containing fluids required for normal operation of the aircraft should be full. Fluids not considered to be part of the empty weight of the aircraft are potable (drinkable) water, lavatory precharge water, and water for injection into the engines. The position of such items as spoilers, slats, flaps, and helicopter rotor systems is an important factor when weighing an aircraft. Always refer to the manufacturer’s instructions for the proper position of these items. Inspect the aircraft to see that all items included in the certificated empty weight are installed in the proper location. Remove items that are not regularly carried in flight. Also, look in the baggage compartments to make sure they are empty. Replace all inspection plates, oil and fuel tank caps, junction box covers, cowling, doors, emergency exits, and other parts that have been removed during maintenance. All doors, windows, and sliding canopies should be in the normal flight position. Remove excessive dirt, oil, grease, and moisture from the aircraft. Some aircraft are not weighed with the wheels on the scales, but are weighed with the scales placed either at the jacking points or at special weighing points. Regardless of what provisions are made for placing the aircraft on the scales or jacks, be careful to prevent it from falling or rolling off, thereby damaging the aircraft and equipment. When weighing an aircraft with the wheels placed on the scales, release the brakes to reduce the possibility of incorrect readings caused by side loads on the scales. All aircraft have leveling points or lugs, and care must be taken to level the aircraft, especially along the longitudinal axis. With light, fixed-wing airplanes, the lateral level is not as critical as it is with heavier airplanes. However, a reasonable effort should be made to level the light airplanes along the lateral axis. Helicopters must be level longitudinally and laterally when they are weighed. Accuracy in leveling all aircraft longitudinally cannot be overemphasized. When an aircraft is being weighed, the arms must be known for the points where the weight of the aircraft is being transferred to the scales. If a tricycle gear small airplane has its three wheels sitting on floor scales, the weight transfer to each scale happens through the center of the axle for each wheel. If an airplane is weighed while it is on jacks, the weight transfer happens through the center of the jack pad. For a helicopter with skids for landing gear, determining the arm for the weighing points can be difficult if the skids are sitting directly on floor scales. The problem is that the skid is in contact with the entire top portion of the scale, and it is impossible to know exactly where the center of weight transfer is occurring. In such a case, place a piece of pipe between the skid and the scale, and the center of the pipe will now be the known point of weight transfer. 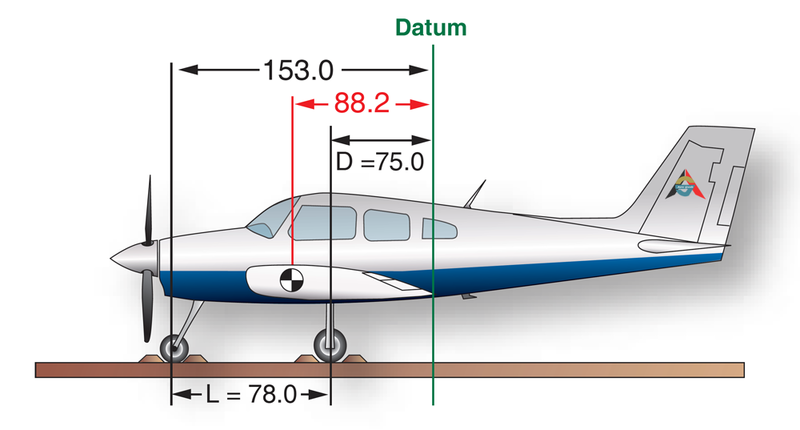 The arm for each of the weighing points is the distance from the center of the weight transfer point to the aircraft’s datum. If the arms are not known, based on previous weighing of the aircraft or some other source of data, they must be measured when the aircraft is weighed. This involves dropping a plumb bob from the center of each weighing point and from the aircraft datum, and putting a chalk mark on the hangar floor representing each point. The perpendicular distance between the datum and each of the weighing points can then be measured. 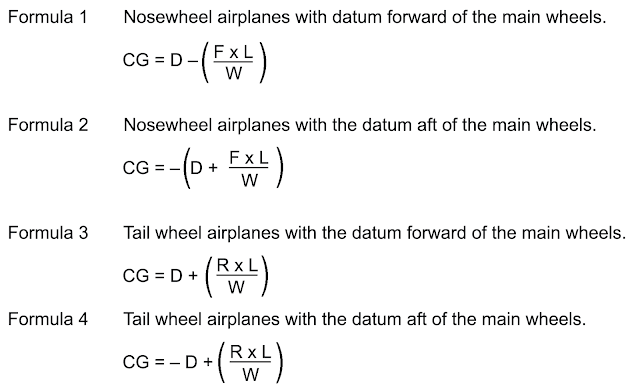 In Figure 7, the distance from the nosewheel centerline to the datum is being measured on an airplane. The nosewheel sitting on an electronic scale can be seen in the background. Aircraft are often weighed by rolling them onto ramps in which load cells are embedded. This eliminates the problems associated with jacking the aircraft off the ground. However, many aircraft are weighed by jacking the aircraft up and then lowering them onto scales or load cells. Extra care must be used when raising an aircraft on jacks for weighing. If the aircraft has spring steel landing gear and it is jacked at the wheel, the landing gear will slide inward as the weight is taken off the tire. Care must be taken to prevent the jack from tipping over. For some aircraft, stress panels or plates must be installed before they are raised with wing jacks to distribute the weight over the jack pad. Be sure to follow the recommendations of the aircraft manufacturer in detail anytime an aircraft is jacked. When using two wing jacks, take special care to raise them simultaneously, so the aircraft does not slip off the jacks. As the jacks are raised, keep the safety collars screwed down against the jack cylinder to prevent the aircraft from tilting if one of the jacks should lose hydraulic pressure. 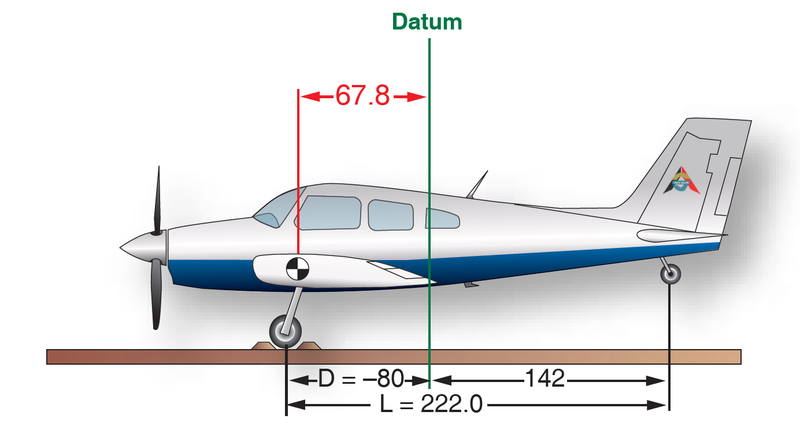 When an aircraft is weighed, it must be in its level flight attitude so that all the components are at the correct distance from the datum. This attitude is determined by information in the TCDS. Some aircraft require a plumb line to be dropped from a specified location so that the point of the weight, the bob, hangs directly above an identifiable point. Others specify that a spirit level be placed across two leveling lugs (special screws on the outside of the fuselage). Other aircraft call for a spirit level to be placed on the upper door sill. Lateral level is not specified for all light aircraft, but provisions are normally made on helicopters for determining both longitudinal and lateral level. This may be done by built-in leveling indicators or by a plumb bob that shows the conditions of both longitudinal and lateral level. The actual adjustments to level the aircraft using load cells are made with the jacks. 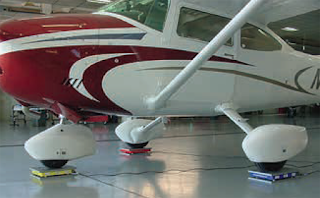 When weighing from the wheels, leveling is normally done by adjusting the air pressure in the nosewheel shock strut. Special precautions must be taken when raising an aircraft on jacks. Stress plates must be installed under the jack pads if the manufacturer specifies them. If anyone is required to be in the aircraft while it is being jacked, there must be no movement. The jacks must be straight under the jack pads before beginning to raise the aircraft. All jacks must be raised simultaneously and safety devices placed against the jack cylinder to prevent the aircraft from tipping if any jack should lose pressure. Not all jacks have screw-down collars, some use drop pins or friction locks. The CG range for an aircraft is the limits within which the aircraft must balance. It is identified as a range and considered an arm extending from the forward most limit to the aft most limit usually expressed in inches. In the TCDS for the Piper Seneca airplane, shown earlier in this chapter, the range is given in Figure 8. Straight line variation between points given. Because the Piper Seneca is a retractable gear airplane, the specifications identify that the range applies when the landing gear is extended, and that the airplane’s total moment is decreased by 32 when the gear retracts. 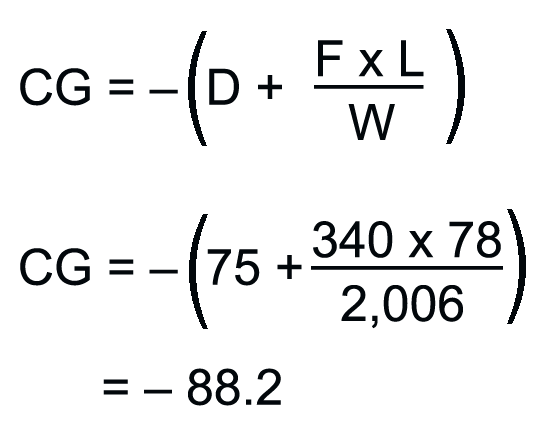 To know how much the CG changes when the gear is retracted, the moment of 32 in-lb would need to be divided by the loaded weight of the airplane. For example, if the airplane weighed 3,500 lb, the CG would move forward 0.009" (32 ÷ 3,500). Based on the numbers given, up to a loaded weight of 2,780 lb, the forward CG limit is +80.7" and the aft CG limit is +94.6". As the loaded weight of the airplane increases to 3,400 lb, and eventually to the maximum of 4,000 lb, the forward CG limit moves aft. In other words, as the loaded weight of the airplane increases, the CG range gets smaller. The range gets smaller because of the forward limit moving back, while the aft limit stays in the same place. The data sheet identifies that there is a straight-line variation between the points given. The points being referred to are the forward and aft CG limits. From a weight of 2,780 lb to a weight of 3,400 lb, the forward limit moves from +80.7" to +82.0", and if plotted on a graph, that change would form a straight line. From 3,400 lb to 4,000 lb, the forward limit moves from +82 to +86.4", again forming a straight line. Plotted on a graph, the CG limits would look like Figure 9. When graphically plotted, the CG limits form what is known as the CG envelope. 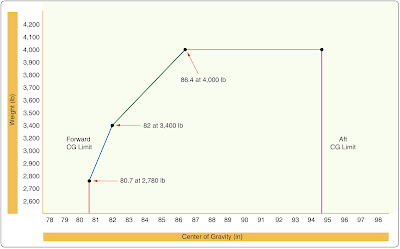 In Figure 9, the red line represents the forward limit up to a weight of 2,780 lb. The blue and green lines represent the straight-line variation that occurs for the forward limit as the weight increases up to a maximum of 4,000 lb. The yellow line represents the maximum weight for the airplane, and the purple line represents the aft limit. For some aircraft, a CG range is given for the aircraft in the empty weight condition in the TCDS. This practice is not very common with airplanes, but is often done for helicopters. This range would only be listed for an airplane if the fuel tanks, seats, and baggage compartments are so located that changes in the fuel or occupant load have a very limited effect on the balance of the aircraft. If the EWCG of an aircraft falls within the EWCG limits, it is impossible to legally load the aircraft so that its loaded CG falls outside of its allowable range. If the TCDS lists an EWCG range and, after a repair or alteration is completed, the EWCG falls within this range, then there is no need to compute a fore and aft check for adverse loading. But if the TCDS lists the EWCG range as “None” (and most of them do), a check must be made to determine whether it is possible by any combination of legal loading to cause the aircraft CG to move outside of either its forward or aft limits. All aircraft have CG limits identified for the operational condition, with the aircraft loaded and ready for flight. If an aircraft can operate in more than one category, such as normal and utility, more than one set of limits might be listed. 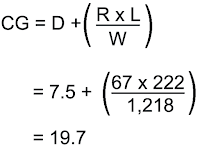 As shown earlier for the Piper Seneca airplane, the limits can change as the weight of the aircraft increases. To legally fly, the CG for the aircraft must fall within the CG limits. 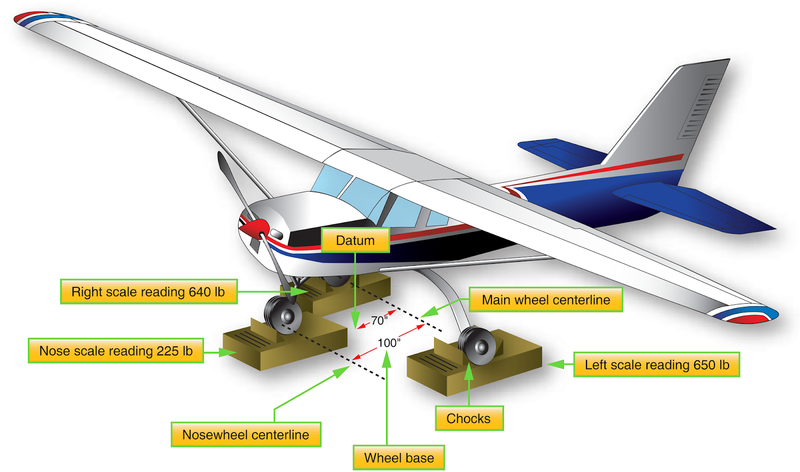 In Figure 10, a tricycle gear airplane is being weighed by using three floor scales. 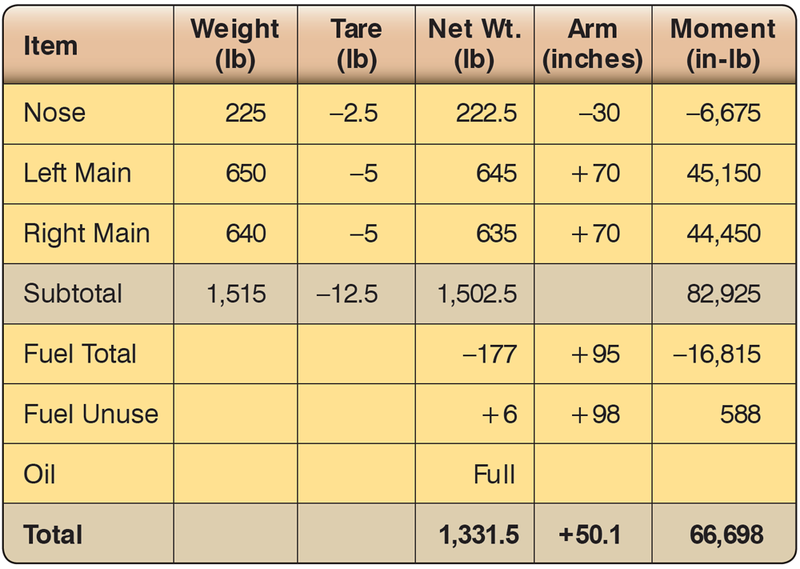 The specifications on the airplane and the weighing specific data are shown in Figure 11. 30 gal aviation gasoline at +95"
Figure 11. Specifications and weighing specific data for tricycle gear airplane. 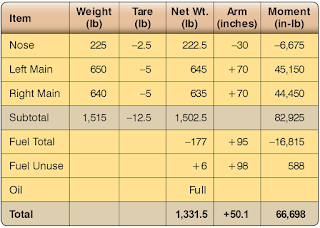 By analyzing the data identified for the airplane being weighed in Figure 10, the following information is determined. Because the airplane was weighed with the fuel tanks full, the full weight of the fuel must be subtracted and the unusable fuel added back in. The weight of the fuel being subtracted is based on the pounds per gallon determined by the hydrometer check (5.9 lb/gal). Because wheel chocks are used to keep the airplane from rolling off the scales, their weight must be subtracted from the scale readings as tare weight. Because the main wheel centerline is 70" behind the datum, its arm is a +70". 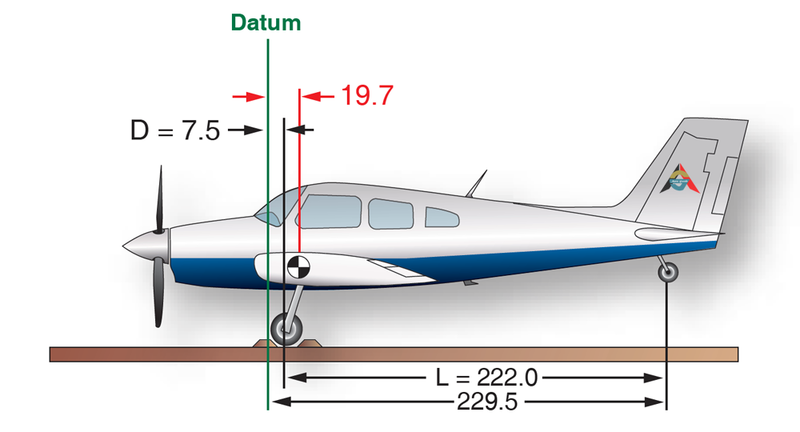 The arm for the nosewheel is the difference between the wheelbase (100") and the distance from the datum to the main wheel centerline (70"). Therefore, the arm for the nosewheel is −30". 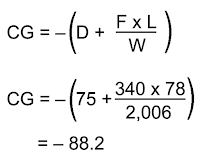 To calculate the airplane’s empty weight and EWCG, a six-column chart is used. 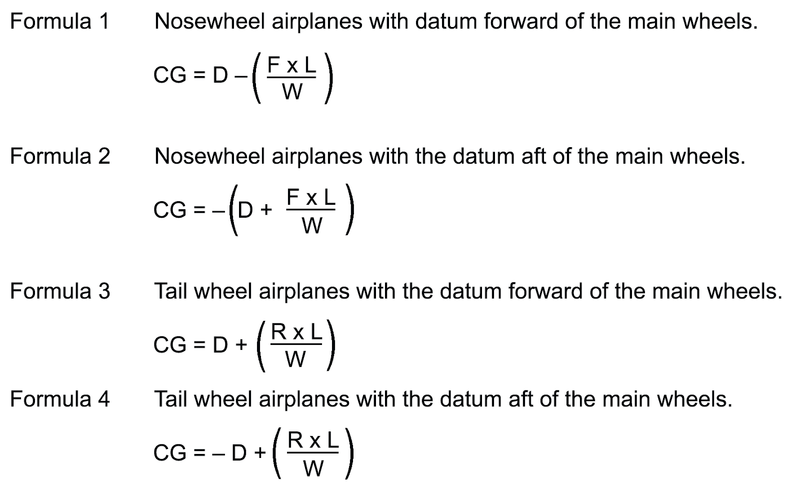 Figure 12 shows the calculation for the airplane in Figure 10. Based on the calculation shown in the chart, the CG is at +50.1", which means it is 50.1" aft of the datum. This places the CG forward of the main landing gear, which must be the case for a tricycle gear airplane. This number is the result of dividing the total moment of 66,698 in-lb by the total weight of 1,331.5 lb. and then divides it by the total weight of the airplane. The arm is then added to or subtracted from the distance between the main wheels and the datum (distance D). 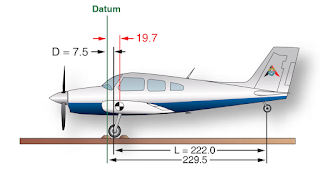 The datum of the airplane in Figure 13 is 100" forward of the leading edge of the wing root, or 128" forward of the main-wheel weighing points. This is distance (D). 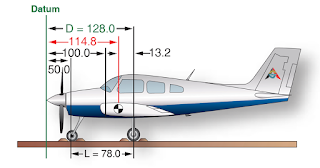 The weight of the nosewheel (F) is 340 lb, and the distance between main wheels and nosewheel (L) is 78". The total weight of the airplane (W) is 2,006 lb. The CG is 114.8" aft of the datum. This is 13.2" forward of the main-wheel weighing points, which proves the location of the datum has no effect on the location of the CG so long as all measurements are made from the same location. The datum of some aircraft may be located aft of the main wheels. The airplane in this example is the same one just discussed, but the datum is at the intersection of the trailing edge of the wing with the fuselage. The distance (D) between the datum of the airplane in Figure 14 and the main-wheel weighing points is 75", the weight of the nosewheel (F) is 340 lb, and the distance between main wheels and nosewheel (L) is 78". The total net weight of the airplane (W) is 2,006 lb. The CG location is a negative value, which means it is 88.2" forward of the datum. This places it 13.2" forward of the main wheels, the same location as it was when it was measured from other datum locations. It makes no difference where the datum is located if all measurements are made from the same location. R x L rather than F x L.
The datum of the airplane in Figure 16 is located at the intersection of the wing root trailing edge and the fuselage. This places the arm of the main gear (D) at –80". 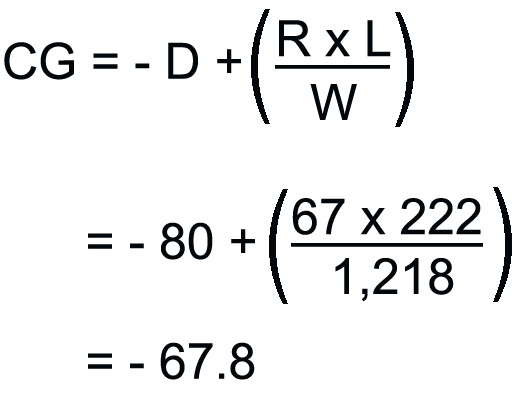 The net weight of the tail wheel (R) is 67 lb, the distance between the main wheels and the tail wheel (L) is 222", and the total net weight (W) of the airplane is 1,218 lb. Figure 16. The datum is aft of the main wheels, at the intersection of the wing trailing edge and the fuselage. The CG is 67.8" forward of the datum, or 12.2" aft of the main-gear weighing points. The CG is in the same location relative to the main wheels, regardless of where the datum is located.